The usual source provides the full manual/documentation… down to the GAL equations. All these enhancements enabled the B008 to create simple, yet powerful Transputer networks on a single expansion card and still makes it the perfect platform for todays Transputer retro experiments/fiddlings. The previous revision E had a ceramic version of the T2xx and used GALs instead of the CPLD you can stop in aboves picture. 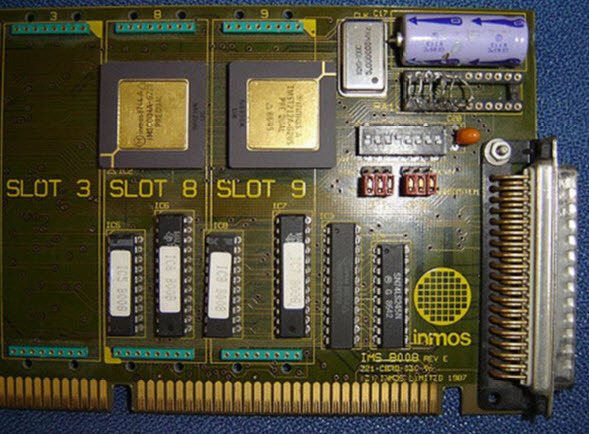 Obviously the Inmos B008 had clones as the B004 did. In this case they used a AMD MACH CPLD from the beginning, a PLCC version of the T225 and everything else was SMD. Alta Technology was a spin-off of Computer System Architects (CSA). Actually I wasn’t aware that ARADEX also made TRAM carriers… One of my first TRAMs was an ARADEX one, so this is a first for me, too. Their interpretation of the B008 theme features just 8 TRAM slots (vs. the 10 “standard”) which are strangely enough sorted in ascending order (0-7) and not like the B008 order of 1, 5, 6, 2, 0, 4, 7, 3, 8, 9. Also the TransAT provides two 9pin D-subminiature connectors in contrast to the B008s 37pin connector – most likely its layout is the so called Aalener Link-Interface. That includes the RS-422 differential drivers and receivers next to the connector (AM26LS23’s and AM26LS33’s). Concerning other parts, besides an C012 they used some sort of CPLD – presumably to control the 16 bit bus – in the photos I have, I can clearly see the traces coming form the ISA Bus’ D[8-15]. It also uses the IRQs 10-12.